OSCAR 4 (Orbiting Satellite Carrying Amateur Radio 4) was an amateur satellite built by the TRW Radio Club of Redondo Beach, California. 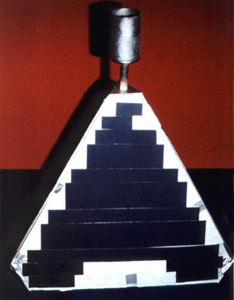 The satellite had a structure shaped as a regular tetrahedron with edges 48 cm long. It featured a tracking beacon transmitter and a 3 Watt 10 kHz wide linear transponder (144 MHz uplink and 432 MHz downlink). Communication was by four independent monopole antennae. Power was provided by body mounted solar cells and batteries. OSCAR 4 had a mass of 18.1 kg. OSCAR 4 was launched piggyback with three United States Air Force satellites on a Titan-3C. The launch vehicle had a partial failure and placed the spacecraft in a lower orbit of 168 km × 29120 km preventing widespread amateur use. The satellite was in operation until 16 March 1966 and finally reentered on 12 April 1976. Total operation time was 85 days. Only about 12 two-way communications were established through the repeater, but one on 22 December 1965 was the first direct satellite communication between the United States and the USSR.